Who doesn’t love the rich, wonderful taste of walnuts? Everyone does, right? Isn’t that why we put them in just about everything? From cereal to candy bars, cookies to bread to muffins, everyone loves the crunchy goodness of walnuts. However, there’s so much more to them than simply a good crunchy flavor. Walnuts contain many important compounds that have almost unbelievable health benefits— health benefits that are so important, you should find ways to eat more of these every single day. Walnuts have gotten a bad rap lately because they are high in fat and calories. The truth is that they are high in calories, so you should limit your consumption to about 1 or 1.5 ounces each day. The good news here is that 1 ounce is all you need to get all the health benefits you can read about below. As for the fat, this isn’t the unhealthy French fry kind of fat; we are talking natural, whole food fat that your body craves. So keep reading for all the reasons you should be stocking up and munching on more raw walnuts. In one PREDIMED study that involved humans, a Mediterranean diet was assessed and it was discovered that walnuts reduced cancer death. In fact, the Harvard School of Public Health performed a study that involved 118,000 subjects and they found that persons that consumed a handful of nuts each day were 20 percent less likely to die from any cause over a 30 year period. If that isn’t reason enough to eat more walnuts, what is? Mice that were fed walnuts in a Harvard Medical School study found that they had a 27 percent slower growth rate of cancerous tumors and 33 percent smaller tumors when compared to mice that were fed a diet including corn oil. It’s believed that the walnuts worked by significantly lowering angiogenesis. Other nuts can’t hold a candle when it comes to antioxidants. Walnuts have twice as many as any other nut. They also have the most potent type of antioxidants and the highest quality. One study measured the antioxidants in walnuts and found that they were 2 to 15 times more potent than vitamin E.
Penn State University researchers found that adding walnuts to a person’s daily diet can help the body prepare for episodes of stress. This study used 22 adults with elevated cholesterol levels then subjected these persons to stress. 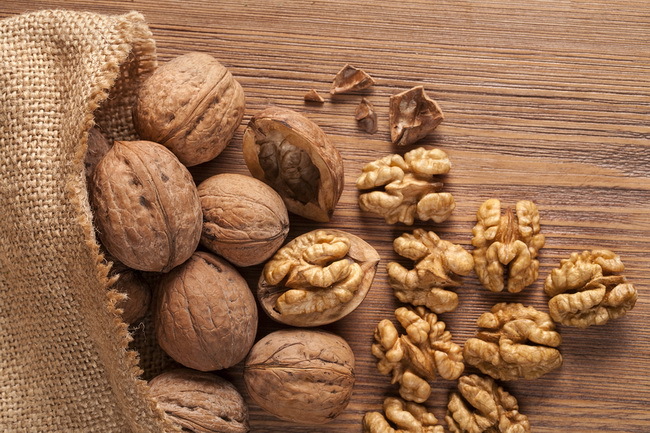 The subjects that had walnut oil and walnuts included in their diets had lower stress responses and lower blood pressure levels than the control group.